Walking through the farmers market this time of year, you can't help but realize that tomato season is still in full swing. Tomatoes are available all year round but it’s not until mid summer that they really come into their own. With the threat of frost in September the season is fleeting as we savour the last few days of summer and all the bounty it has to offer. The weather begs to differ with hot, sultry days and cool nights but things can turn on a dime. What better way to celebrate my absolutely favourite fruit than with a Tomato Festival. When I mentioned to my worldly travellers where I was headed this past Sunday they had visions of La Tomatina in Spain . Although it is on my bucket list, this was a celebration of a different colour. And celebrate we did with an array of delicious and innovative little bites topped off with the piece de resistance a variety of freshly baked pizzas from a wood fire oven for the second annual Tomato Festival at Sunshine Farms. When wandering the venue you literally felt the excitement. Heirloom tomatoes begging to be savoured lined the beautifully decorated large wooden farm table where we attended an Earth to Table dinner a few months ago. Perfectly plump workhorse Campbell's tomatoes, pints of adorable cherry tomatoes just begging to be snacked on, and of course, the queen bee of the pack, the knobby heirlooms, in every shape and size imaginable. some of them making their noble debut. The rich tapestry of colours, the diversity and depth of flavour, and the general beauty of the tomatoes provided an experience that your average grocery store tomato just cannot match. I wait all year for their arrival and a festival to celebrate their unimaginable flavour and beauty was right up our alley. My friend Dina of Olive Oil and Lemons (and this year her husband George), Laura of The Culinary Travel Guide and our friends Carola and Bob welcomed the shade of an abundant fruit tree while we listened to the strains of country and western music. Sparkling tomato water was a refreshing bonus to ward off the heat of a lazy summer day as we listened to the sultry sound of Cowboy Ted a bronco buster from Douglas Lake Ranch near Kamloops while relishing each little bite with friends old and new. It was nice that Ted remembered us from last year since we remembered him. In recent years, heirloom tomatoes have caught the fancy of an increasing number of gardeners and local growers making them more widely available. These are the tomatoes that people have fallen in love with, and have deemed worthy of keeping from plants that have been grown year after year and handed down from gardener to gardener. At the farm, owner Jon Alcock showed us how to collect the seeds from these prized tomatoes last year. Heirloom tomato seeds, like your grandmother’s china, are viewed as precious family treasures that have been passed from generation to generation. For an heirloom tomato to qualify for heirloom status it has to have been around for at least 50 years. Newer genetic variations are classified as hybrids. 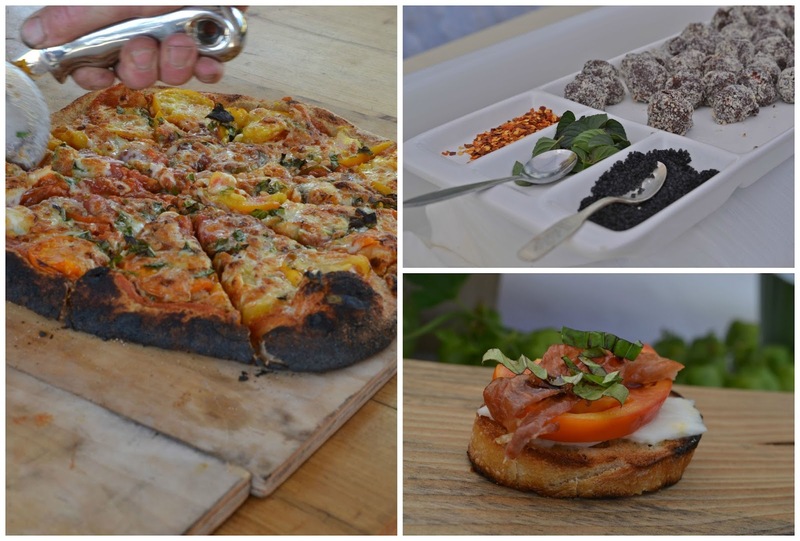 Heirloom tomatoes have several advantages over hybrids. Most importantly they have outstanding flavour! They also come in a variety of colours, pink, yellow, orange, maroon, purple and may even be marbled or striped or have unusual shapes. Until the 20th century and the onset of hybrids tomato varieties were every shape but round. With names like Cherokee Purple, Brandywine, Kellogg's Breakfast, San Marzano, Yellow Pear, Radiator and Charlie's Mortgage Lifter how can you resist!!! Nature blesses perfectly ripe summer tomatoes with their own ideal dressing. Rich olive oil and a generous seasoning of salt and pepper are practically all that’s needed to bring out the sunny flavour of summer tomatoes and complement the sweet-tart acidity of their natural juices. Sunshine Farm is nestled in the hills of South East Kelowna on just a little over 12 acres. 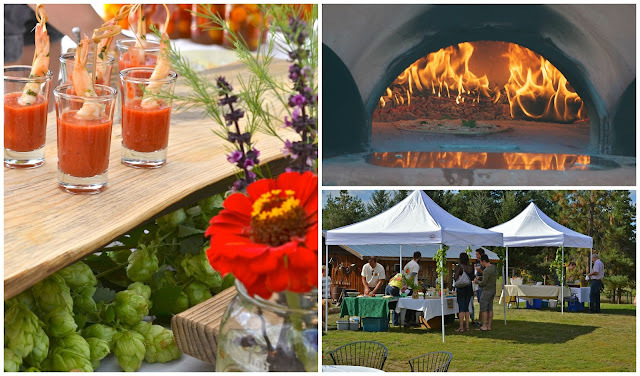 It has been owned and operated by Jon and Sher Alcock since 1987 when they decided to create a life on a sustainable farm for their family that also serves its community. They specialize in Certified Organic rare, heirloom, and open pollinated vegetables, herbs and some fruits through seed sales but chances are that if you go to one of our local farm-to-table restaurants in the city their unique signature would be felt on the menu. Their passion and knowledge shone through as we took a tour of the property with Jon explaining some of the more unusual offerings and the history behind them. Not only is it a sustainable farm but is the setting for Vocational Development Opportunities for challenged adults in the community. The setting is diverse, offering a chance to learn about equipment operation, woodworking, plant identification, seed collection, harvesting, labelling, math skills, weighing, and packaging. 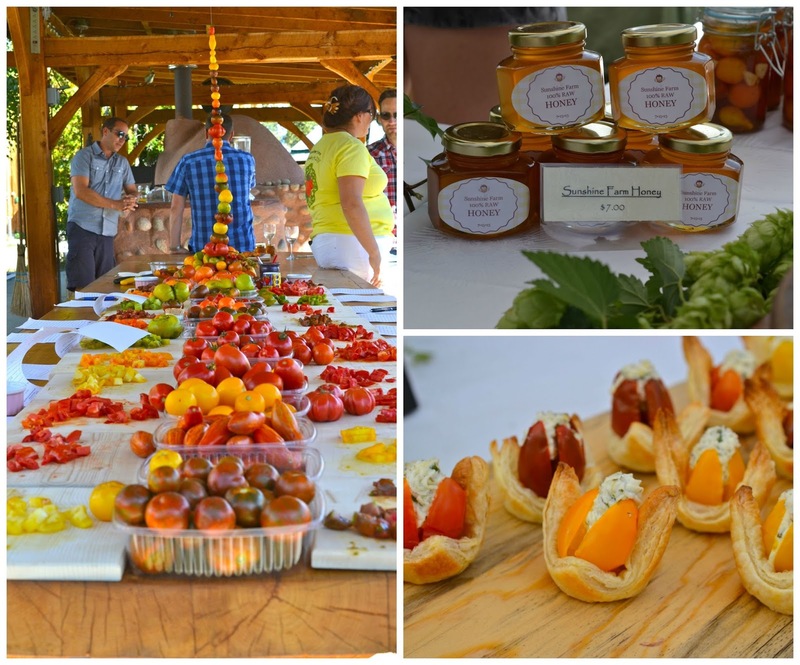 Rustic elegance and abundant charm provided the ideal setting for a relaxing afternoon in the Okanagan sunshine while we enjoyed the finest, freshest culinary presentations from Mona Johannson who worked magic with these amazing heritage varietals picked only moments before in their fields. 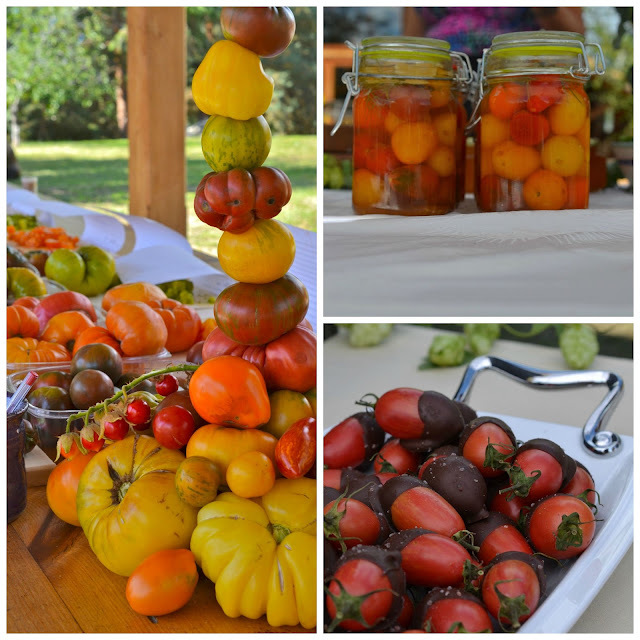 The simplicity of life in this bucolic setting inspired a simple and yet stunning presentation where everything except the olive oil and dairy were produced right on the farm including the over 150 varieties of heirloom tomatoes. Because their gardens are a stones throw away, Mona can pick produce and local products at just the right moment to create culinary masterpieces at peak perfection for catered events and outstanding dinners such as what we have experienced in the past. Here in the Okanagan Valley, farmers and chefs take pride in their commitment to quality and share a passion for locally grown food and nowhere is it more evident when Jon speaks of his love for his land. His passion and knowledge shone through while explaining some of the more unusual offerings and the history behind them. Regardless of the farm’s size, there is a lot to be done especially with the strain of the heat. Through our conversation I was struck with how farming really not only takes technical know-how but it takes a lot of courage. As a vocation it is certainly not for the faint of heart. 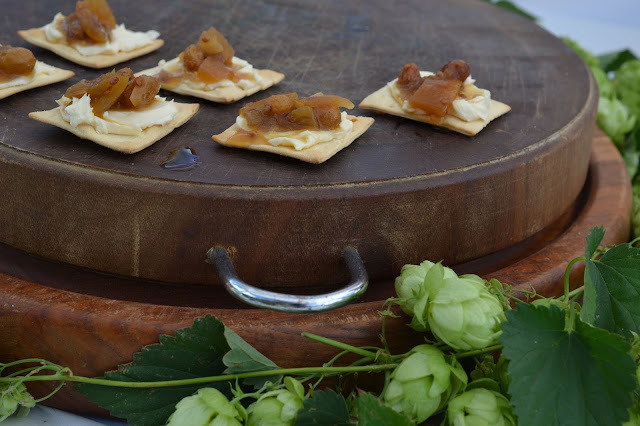 Today I offer you the Alcock family's recipe for Tomato Jam that was one of the amazing offerings at the festival. They had many jars for sale but I simply was not quick enough. Mona says, "I know the Jalapeno seems a little crazy, but really, it all tastes amazing when it is finished. Enjoy!" To echo Jon’s sentiments, it really takes all of us to support the local agricultural community of which we’ve grown so fond of in the last years of ‘eating local’ and we need to continue seeking the closest connection possible with our food producers. Enjoying a festival celebrating our bounty truly is the quintessential essence of that spirit and should not be missed! To celebrate with the Alcocks is like being part of the family. Core and chop tomatoes, place in large pot. Add all other ingredients and bring to a boil over medium heat. Lower to low/medium and simmer 1 ½ to 2 hours. To test thickness, place a teaspoon or so on a frozen plate, let sit for a minute. If mixture sticks like gelatin when plate is tipped, it is ready • 220 degrees F, if using a thermometer. Pour into jars or process for long storage. Yet another way to preserve my favorite fruit!! Great post! We are off next week to visit you neighbors. This time we are heading to Toronto along with our Rhode Island son and daughter-in-law to visit Toronto. We've always enjoyed travel in Canada but have never been to our neighbor directly northeast, Toronto. We always feel welcome and at home. I enjoy reading about your food adventures. They sound like so much delicious fun. My family loves loves tomatoes, and the jam sounds delicious. Much better than what they do in Spain! Thanks for the recipe.